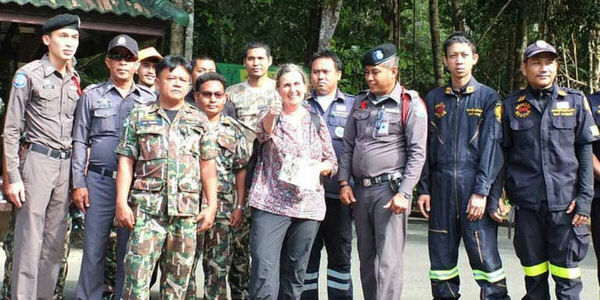 A German tourist has been rescued from the Koh Chang jungle, after a huge search by over by 50 police officers, soldiers and National Park rangers. Aged 60, Christine Junghanel disappeared on Tuesday when visiting Koh Chang’s main waterfall at Klong Plu. Part of a tour group staying at nearby Klong Prao resort, she reportedly told fellow members of her group “I came here before – don’t worry about me” before setting off alone to trek the nature trails around Klong Plu Waterfall. Klong Plu is main waterfall on the island, with a clearly marked path from car park to the falls themselves, though it does have an additional closed off trail which leads to the upper reaches. It is this route, it appears, that she took to head off into the forest. When Christine Junghanel failed to materialize back at the resort that evening, her friends become increasingly concerned and alerted the local authorities. Search and rescue teams were immediately scrambled, but after failing to locate her by late into the evening, the search was called off until first light. She was finally discovered, safe and well, at 10.20am just 500 metres from the falls themselves. Dehydrated and scared, the tourist said she has become disorientated after deviating from the path and knowing she was lost decided to sleep overnight, in the hope she could retrace her steps the next day. Once again, local authorities have appealed to tourists to stay in designated areas when visiting attractions in the National Park. This is the 2nd simliar incident in the last few months, so they also renewed calls for people, foreigners or Thais, not to wander into the Koh Chang jungle alone. There are organised treks available on Koh Chang, with experienced guides which enable tourists to enjoy the interior of National Park safely, they added.